The Selimiye Mosque and its social Complex in Edirne is considered the highlight in the career of the most famous Ottoman architect, Sinan. It was built between 1569 and 1575. Surrounded by four tall minarets, the Mosque has a grand dome atop it. The adjoining Social Complex includes two madrasas, a bazaar, a school, a clock house, a courtyard and a library. After a few days in Turkey the ennui that I generally reserve to Baroque churches had settled in for Ottoman mosques. "You seen one, you have seen them all." I figured. So, you may understand why I really questioned the 6.5h one way trip from Istanbul upon arrival in Edirne. But the site really won me over as soon as it entered my view and even more so when I stepped into it. The murals and the proportions are stunning. To me it felt as if all of Ottomon architecture was coming together in this great mosque by Sinan. Edirne having been the second Ottoman capital (after Bursa) has several representative Ottoman buildings to visit. Specifically, the tentative site of Sultan Bayezid II Complex Is well worth the short stroll out of town. I did Edirne in one hellish day trip from Istanbul. The net driving time would be less than three hours. However, you need to get out of Istanbul first and that can easily take an hour or more. If you travel by bus (as I did), you will also spend significant time getting to the bus station in Istanbul and waiting around (Metro Otogar). I think in total I spent more than 50% of the lengthy trip time in Istanbul (6.5h to, 4.5h back). Finally, the bus station in Edirne is quite far outside town. Even by cab I would assume this takes 15-20min. By local bus I spent around 30min to get into and out of Edirne. Local lines 1 and 3 will do the trick, but they make quite a few detours to take you into town. The central bus station in Istanbul is quite messy. There is no central departure or ticketing area. Instead the individual ticket offices with the platforms form a huge circle around the metro station. To make matters worse, the same line may operate multiple offices in the bus terminal. The busses for Edirne depart from the Western side of the terminal (Gate 115 for Metro busses, Nilafür is nearby). Of the two companies I used I found Nilafür busses more comfortable than Metro. They were also faster as we did no restroom stops. Please note that the busses were full both ways, so I would not rely on getting a ticket short notice. Schedules for multiple companies can be found here. From Edirne you should be able to connect to Greece. Crossing into Bulgaria seems to be more difficult as there are no direct busses, so you will probably need to take a cab to the border. Last but not least, you can take a but to Canakkale for Troy. I visited Edirne in January 2014. It is quite off the beaten track due to its geographic position not far from the borders of Bulgaria and Greece. It is around 238km from Istanbul but well worth a visit. The main highlight of this WHS is the squarish Selimiye Mosque built by Mimar Sinan around 1575. The 4 minarets that adorn this mosque are indeed the tallest in the Muslim world. It is built in the centre of a kulliye, ie. a complex including a hospital, an Islam teaching centre, a bazaar, gardens, a courtyard and also a cemetery. I enjoyed the fact that the locals are the main inhabitants of this town and tourists are a minority (unlike Istanbul). The best mosque interior in Edirne (if not the Islamic world!) can be seen in the old Eski Mosque, with its red and white archways (like Cordoba's mesquita) and the huge black Islamic calligraphy on the walls. Another mosque worth visiting is the Ottaman Üç Şerefeli Mosque with is candy-like spiral minaret. As an aside, do try the Edirne Kofte! Truly delicious! 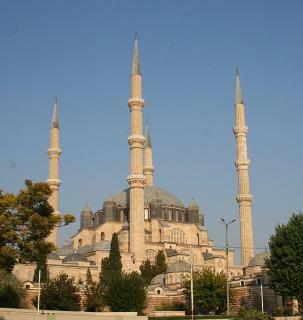 Edirne (known as Adrianople until the Ottoman period) is easily accessible by bus from Istanbul and Canakkale. This fine example of Muslim architecture is regarded as Mimar Koca Sinan's master work, eclipsing that of his Selimiye Mosque in Istanbul. 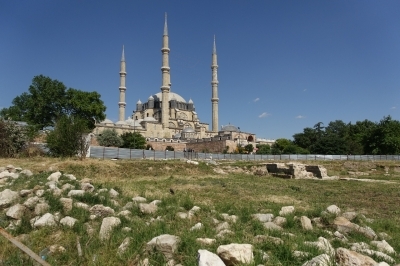 An unusual feature is the statue of Sinan that stands within the gardens of the mosque. Besides being a Muslim Holy Place, the mosque in Edirne is also regarded as a Baha'i Holy Place. Between 1843 and 1848, Baha'u'llah, founder of the Baha'i faith was exiled to Adrianople by the Ottomans, and during that period he and his family worshipped regularly at the Selimiye Mosque. 107 Community Members have visited.